The Indian Women’s senior national team takes on Nepal in their opening match of the first round of the 2020 AFC Women’s Olympic Qualifying Tournament on Thursday (November 8) and will be hoping to get off to a strong start aiming to get the three points to start the campaign in the best possible manner. 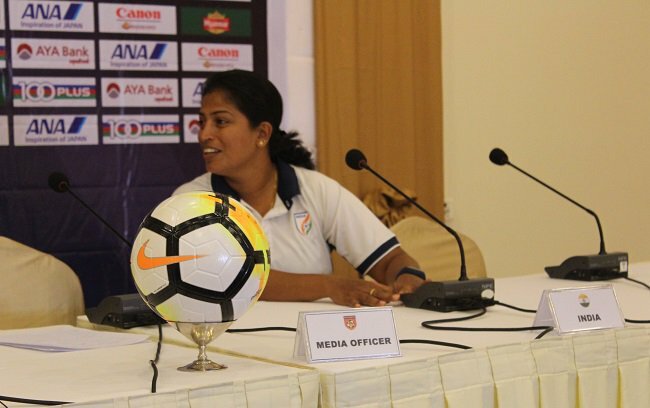 In the previous four editions of the competition, the Indian side has never made it past the initial stage and this time around, there is a high degree of confidence within the team after a successful three-week preparatory camp in Mumbai under head coach Maymol Rocky. The first game will undoubtedly be of utmost importance and ahead of the much-awaited contest, the-aiff.com caught up with Rocky for a brief conversation. What are your thoughts looking at the fixtures ahead of the team? I feel we have got a favourable set of matches as our first two games are against familiar opponents (Nepal and Bangladesh) and we play the hosts in our last match. In such tournaments, how you start the competition is really important and the Nepal game will be extremely crucial for us to gather the much-required momentum. How was the training camp in Mumbai? How do you feel the first-timers gelled in with the rest of the squad? The camp was very good and quite fruitful, in my opinion. All the girls responded to my instructions and applied themselves well. Even the girls who were not selected in the final team also grew as players and improved greatly. I feel we have built quite a cohesive unit and it puts in a good position ahead of the three games. The entire team is like a family and the youngsters who came in for the first time were made to feel part of the group from the very start. The young girls were guided by the senior players, who made them feel comfortable and helped them with any issues. What is your assessment of the squad that you have picked? The 20-member squad that has been picked has a great mix of youth and experience, which is extremely important for every team. I tried to include as many youngsters as possible, including a member of the U-19 national team, and in the future, we will look to call up more players from the junior squads as well. If India is to make it to the next round, how big an achievement would it be? No team before us has ever made it past the first round and so, it will definitely be historic if we are to qualify. It will be a huge boost for the girls and I am confident that we can make it. We have prepared well for the challenge and will leave no stone unturned in fighting for our place in the next stage.